Juglans nigra, the eastern black walnut, a species of flowering tree in the walnut family, Juglandaceae, is native to eastern North America. The black walnut is a large deciduous tree attaining heights of 30–40 m (98–130 ft). Fruiting may begin when the tree is 4–6 years old, however large crops take 20 years. Total lifespan of J. nigra is about 130 years. Black Walnut supplements can be bought at health food stores and are available in capsule and liquid form. In such cases always follow the dosage instructions given on the product label. Use a handful of hulls or leaves and add to boiling water. Planting nuts or seedlings is the most reliable way to start walnut trees. 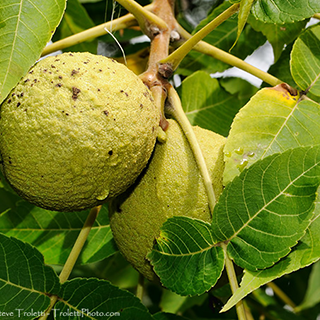 Walnut plantations can produce high-quality crop trees in 35 to 50 years. This is half the time natural stands take to mature. In September, check the ground underneath your trees regularly for dropped nuts and collect those. The leaves are stripped off the tree singly, in June and July and dried. Gather the leaves only in fine weather, in the morning, after the dew has been dried by the sun.